There’s a small but superb live club in the heart of Luxembourg City called den Atelier. 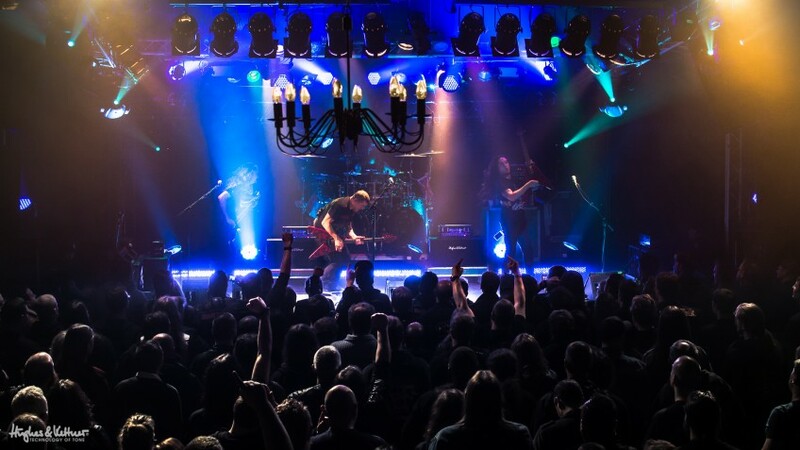 It was Canadian thrash metal gods Annihilator – led by frontman and guitarist Jeff Waters – who took the stage the last time I was there. 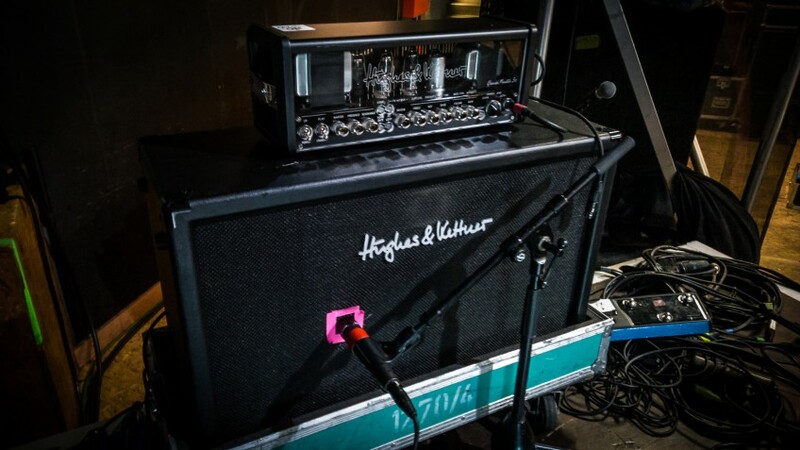 Jeff has long been a Hughes & Kettner endorser and he’s become a great friend over the years (check the last interview we did with him when Annihilator took over our showroom for a week of rehearsals here! ), so we just had to be in the audience when he and his bandmates came to our neck of the woods again. Our expectations were running high, and the gig was every bit as good as we had bargained for. Then again, there’s not that much that can go wrong when a metal band as tight as this raises the roof with razor-sharp riffs, with an adoring crowd lapping up the great sound radiating from the stage. And that’s exactly how this gig went down. Annihilator razzled and dazzled us with one knockout blow of a song after another. While the drumming powerhouse that is Mike Harshaw and the band’s newly-recruited bassist Rich Hinks locked down the grooves like Siamese twins joined at the motor area of the parietal lobe, Jeff and rhythm guitarist Aaron Homma served up a smorgasbord of delicious riffs. It was an aural feast for metal fans and connoisseurs of beefy guitar sounds. As wonderful a workout as Annihilator’s performance on the night was, the afternoon soundcheck was the real revelation for me. Before I expound on this, though, let me remind you that Annihilator is a thrash metal outfit, and that genre is not exactly known for restrained chamber music recitals. As we approached den Atelier’s main entrance, I could clearly hear the thud of Mike Harshaw’s jackhammer double-bass patterns. The drums sounded just as you would expect an unamplified kit to sound in a midsized hall. It’s something that every rock and pop musician instantly recognizes – that telltale ambience of large rehearsal rooms, of empty halls, of the Frankfurt Musikmesse at 9 o’clock in the morning before the fairgrounds open to the public. A few moments passed before I detected a faint trace of Jeff and Aaron’s guitars warming up. The power of Mike’s drums was, for the moment, masking their signals. But anyway, Jeff and Aaron plug into guitar rigs that are pretty small: ridiculously so, in fact, when measured against the humongous stacks other practitioners of the metal arts routinely park on stages. One GrandMeister 36 and a 2×12″ Hughes & Kettner cab each do the trick. Bassist Rich plays over a similarly streamlined but equally effective setup. The guys each have a wedge monitor on the floor in front of them, and during soundcheck each of them patiently waits to set their volumes around Jeff’s in-ear requirements. This tells me something I had suspected all along: Annihilator is a no-nonsense outfit that cuts right to the chase when it comes to the business of being a working band. These guys actually mix their own monitor sound. A small rack with a 19″ mixer placed right next to the drum riser is easily accessible to everyone. A quick nudge of a fader is all it takes to get the level right. Now that’s what I call efficient. The band’s ideas about speed and convenience are also reflected in the rest of its stage setup. Mike’s drum set dominates; there’s little else in the way of distractions apart from the subtle visual accents and seductive blue glow of the two GrandMeisters (well, plus two spares!) perched on 2×12 cabs. With this comparatively simple setup, the stage seems larger than it is in den Atelier’s relatively intimate confines, and affords the performers more room to put on the show. That space is put to good use: even during the sound check, Jeff sweeps across the stage like a Tasmanian devil, firing off a flurry of licks and leads. If the euphoric expression on his face is any indication, he’s certainly tuned in to the moment and enjoying the ride. Yet the volume remains remarkably low, with the drums dominating and the guitars and bass more a whisper than a shout. But then the sound engineer pulls up the faders. What happens next is an object lesson in applied physics. That whisper of a moment ago swells to a paint-blistering roar ferocious enough to burn itself into one’s synapses. In a split second, the soft musical stylings of a school band are transformed into all-out thrash metal mayhem. The drums, now reinforced by the PA, are all snare-shot lightning and kick-drum thunder. The guitars cascade over, under and around the beats, with Jeff’s vocals hovering just above the maelstrom. On top of that, you get a free diaphragm massage courtesy of a muscular PA put to very good use. It moves some serious air, and perhaps even a little ground. The band’s the mallet, the PA’s the forge, the room’s the anvil, and we’re getting hammered into shape with the tightest, most crisp metal sound imaginable. 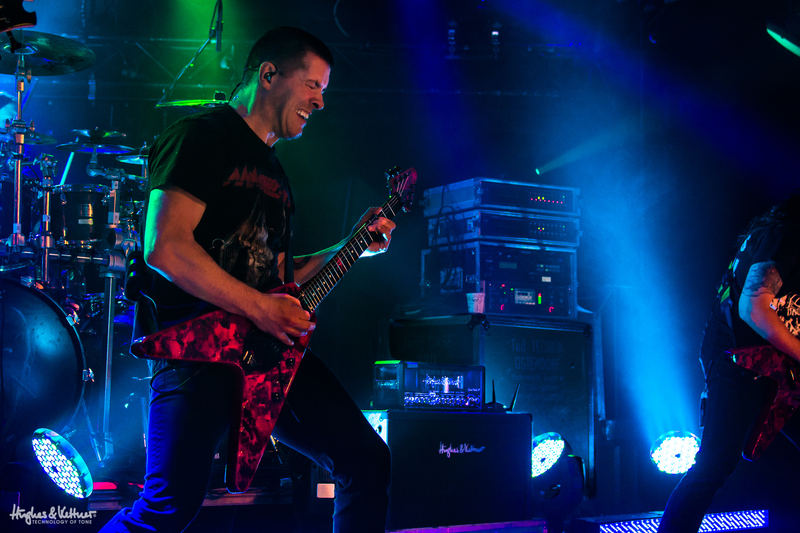 Jeff Waters and Annihilator live at den Atelier in Luxembourg, November 2015. Note that the rack controlling all Jeff’s in-ear levels (and other stuff, we must admit) is way bigger than his actual H&K amp setup! But it’s not like we’re being bludgeoned with volume; it’s more like a nip-and-tuck job executed with steely surgical precision. This is a very different approach to gigging than the traditional method of cranking huge, ungainly amp heads. Granted, small and midsized heads and lunchbox amps like GrandMeister 36 are conveniently portable. But who would have thought that they could be such a smart, efficient and effective solution for even the biggest stages? After all, Jeff has rocked gigantic metal festivals like Wacken and the Hellfest in France with this very setup, which goes to show that the size of the event doesn’t dictate the size of the rig. Traditionalists still expect to see the stage cluttered with equipment – understandably so, because generations of players have been weaned on towering stacks and walls of speakers. But even the old guard has to admit that there’s a paradigm shift underway. Why haul a ton of equipment with you just for the sake of appearances? Isn’t it an anachronism to be parading around unwieldy dinosaurs that take up valuable space when advances in stage technology could make life so much easier? And to what end, other than to satisfy conventions? The trend in industries like consumer electronics is that smaller and more powerful is better (unless you’re a fan of the gargantuan iPhone 6, of course!). Jeff Waters’ GrandMeister setup waiting to get soundchecked at the den Atelier gig. Ordinary consumers are eagerly embracing these advances, while we musicians remain mired in old-school traditions. Rock guitarists are a free-spirited bunch, right? Yes, but many of us remain oddly conservative when it comes to our gear. In good faith, we continue to pay homage to standards set in the 1970s, but have long since been eclipsed. Back then, there was no in-ear monitoring and PA technology was a lot more primitive than today, so amps were cranked to compensate for these shortcomings. But why do we persist with this today? 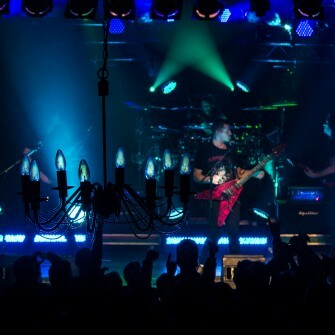 I’d wager that the Annihilator gig would have been an exhausting experience with traditional equipment. Jeff would have turned his amp up loud enough to keep up with the drum kit, and the second guitarist and bassist would have followed suit. Plus, the stage monitors would have had to compete with all that and added to the din. This situation often escalates as players try their best to be heard over everything else. Volume discipline is abandoned and things get painfully loud. You’ve surely experienced something similar and maybe even remember the days when temporary tinnitus was an integral part of every aftershow party. It’s annoying, distracting, tiring and, in the long run, debilitating. Yep, goodby tinnitus indeed. 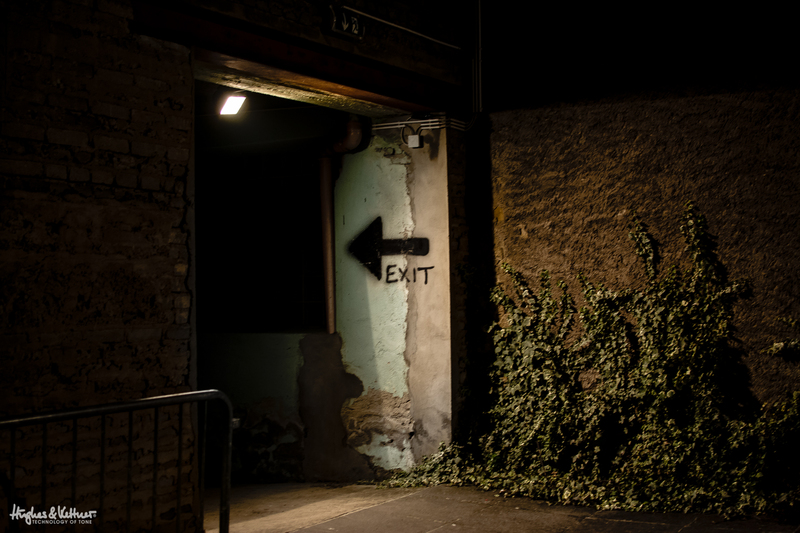 This is the way out at the back of den Atelier – or, to put it another way, the glamorous secret exit rockstars can used when they don’t want to get mobbed by screaming fans! It’s not that laissez-faire, rock ‘n’ roll attitude that made the den Atelier gig such a wonderful event. That thrilling rock show that brought so much joy to the audience, and was so inspiring and satisfying for the musicians, was the result of a focused mindset and a strong work ethic on stage and off. I’ve long known that it takes discipline to be a free spirit. And now I’ve come to the realization that it’s best to play softly if you want to be heard loud and clear. First published: December 04 2015. Most recent update: December 04 2015. I think he is just showing us the very early version of…..the SHOCKER! Yikes! What happened to Jeff’s hand??? Two fingers missing! Will he be able to continue to play guitar?